The monetization gap is understandable given the huge difference in price points between the iPhone and the hundreds of Android devices. Unlocked, the iPhone is the most expensive smartphone on the market. There’s one device and the only option is storage (and color). In contrast, the cheapest Android can be had for <$50. The vast majority of new smartphone users coming online in emerging markets are from the lower and middle income groups, many of whom are accessing the web for the first time ever. They can’t afford a $1000 device, which is what an iPhone can sell for unlocked. This helps explain the monetization gap among other reasons (Android fragmentation, etc.) And it poses a problem for developers trying to make money from the millions of Android users in emerging markets. Mobile advertising really isn’t an effective strategy since ad markets are nascent – extremely small in aggregate size and much less productive (i.e., lower CPMs). And even on iPhone or in developed markets, ads can worsen the user experience and are tough to make money off of unless you have huge numbers of users or a highly valuable audience. So ad-supported isn’t a viable model. What about paid app models? There are problems here as well. For the lower end of the market, willingness to spend just isn’t there. It’s hard enough to get someone to spend a few dollars upfront on a paid app download in developed markets, let alone in a market where a user might only be earning $5-10k a year, maybe less. So charging upfront doesn’t work well. So what’s the solution? I think WhatsApp has figured out an interesting model. A user can use the service for free for a year, but after 12 months has to pay a flat $1 per year to continue using the app. It’s a sort of “micro SaaS” model. You get a 12-month free trial period and then have to pay an annual upfront fee to subscribe to the service. WhatsApp has a very strong network effect, so the likelihood that someone who’s used the service for a year and whose friends are all using the service will balk after a year at paying $1 to continue subscribing is low. At a $1 per year, WhatsApp is reasonably priced for any user that’s able to afford even a cheap Android device. A basic SMS plan will easily cost as much as WhatsApp charges for a year and will also be volume capped. It’s a good value. The downside of this model is that it really only works at large scale. Having 10m users paying you $1 a year isn’t a venture-scale business (though very interesting if you can bootstrap). 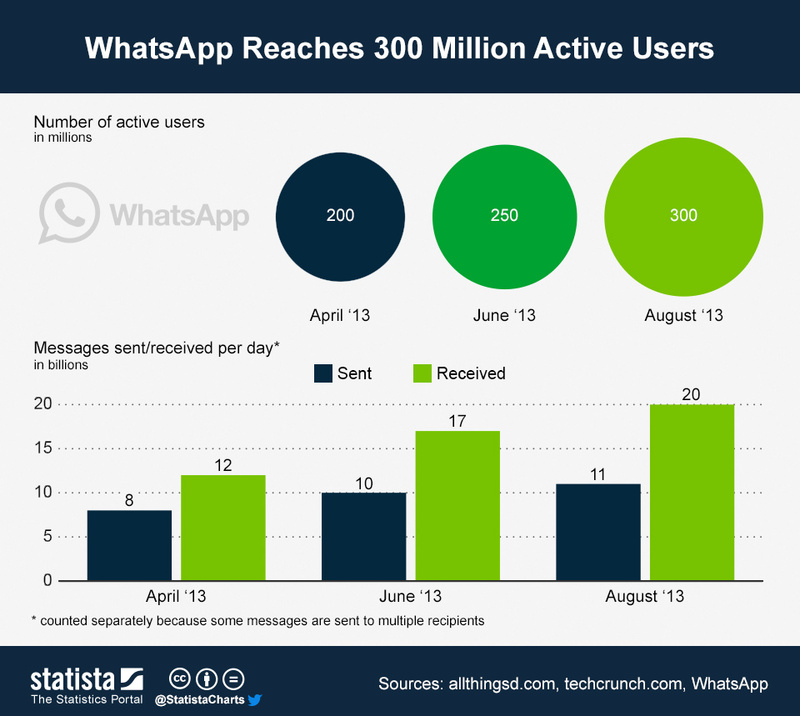 At 300m, which is Whatsapp’s latest user count, this is a sweet business (see image below via Statista). And, as I wrote last week, Messaging happens to be “one of the two killer apps on the smartphone,” so it has huge addressable reach. There’s also some risk that the service is challenged by free services that don’t ever charge for users to subscribe and look to advertising, freemium, or in-app purchases for monetization. At a $1 subscription, there’s really no sunk cost and there’s no technical challenges around switching as there might be in an enterprise SaaS. There is a huge switching barrier though in the network effect, so I think fears of WhatsApp displacement are overblown (not to mention the fact that it’s a simple, reliable, very well-designed product). I’m not saying this model is for everyone. Mobile ads, mobile commerce, and in-app purchases work extremely well in some cases, especially in developed markets. But I’d like to see more services experiment with the “Micro SaaS” approach and would love to hear thoughts on other categories that are suitable. There’s really two sets of major players on mobile. The first is historically desktop-focused companies where their pageviews started on the desktop and are now shifting rapidly to mobile as the share of time spent by users switches from the desktop to smartphones and tablets. This includes services like Groupon, Google Maps, Yelp, Dropbox, Facebook, Twitter, eBay, Fab, Digg, Huffington Post, Gmail, Linkedin, Amazon, Skype, Salesforce, Kayak, TripAdvisor, and a whole host of others. The second group is companies who started on mobile and don’t make sense without it. Evernote, Uber, Prezi, WhatsApp, most mobile games, Roambi in the enterprise, and others are in this category. What’s interesting is that in terms of pure reach, the traditional desktop companies are really dominating. The first wave of adoption of mobile apps has benefited strong desktop brands whose services make as much sense or are stronger even on mobile. Check any smartphone n the US and you’re likely to see some mix of Facebook, Yelp, Google Maps, and Twitter apps to name a few. Perhaps this shouldn’t be surprising since these are some of the most popular services globally. And as mobile increases as a percentage of online time spent and as total hours spent online increases because of mobile, you’d expect these services to benefit. The next wave of adoption is of mobile-first services. For some companies like Evernote and Whatsapp, the boat has already sailed in this regard. For others, there’s huge headroom for adoption. I’d also argue that there should be a whole slew of services built from the ground up for mobile that we haven’t seen yet. This is the “third wave opportunity” for mobile apps. Gaming and Messaging have been the two killer apps on the smartphone, the former in terms of total time spent and the latter in terms of frequency. After these, your traditional desktop services like Gmail and Facebook consume a ton of time. And then you have your set of mobile-first services like Uber that aren’t in the Gaming or Messaging categories. That last category is growing rapidly and should see many new players emerge. There are new ways of re-imagining everything we do on the Web, but for mobile. For instance, Prezi is re-imagining how you create and view PowerPoint-like presentations on the iPad, and Roambi is reimagining Business Intelligence for mobile. In particular, I think there’s a whole host of enterprise applications that can be rebuilt from the ground up for smartphones and/or tablets. CRM, corporate chat clients, time sheeting, meeting management, conference dial in, and Excel/spreadsheeting are a few examples of generalized apps that need to be rebuilt for smartphones and tablets. I also think there’s a whole slew of vertical-specific apps that are ripe for the taking. Hospital management, big law firms, personal financial advising, hotel management, auto dealers, financial traders, and many other areas have a need for specialized mobile apps. In some cases, the incumbent, traditional desktop players will get their act together when it comes to mobile and continue to dominate. In other areas, these players will either be too late to the opportunity or might lack the ability to, whether because of organization issues, a lack of talent, or something else. If I was investing in or looking to start a company, I’d be looking for these third wave opportunities, especially in areas where the incumbents aren’t equipped to capitalize on the opportunity. 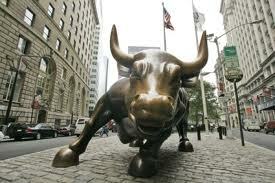 Wall St’s too short term? Look in the mirror. A friend sent me a link today to Jeff Bezos’ letter to shareholders from Amazon’s 1997 Annual Report. It’s a great read. Bezos lays out his long-term operating principles and basically cautions investors that Amazon will (a) focus on long-term strategy and dominance; and (b) this will mean that it will sacrifice short-term profitability. Amazon continues to follow this strategy today as it invests heavily in long-term bets (AWS, Kindle, logistics infrastructure, etc.) and runs a low-margin business. And investors continue to reward the company. The stock is at an all-time high and it’s market cap is approaching that of traditional software giants like Oracle. The latter fact is pretty astounding when you realize that Oracle had $5b of operating income quarter, whereas Amazon had <$100m. I say all of this because one of the big debates in Silicon Valley over the last 4 years has been over the merits of going public versus staying private. And one of the most often cited reasons for staying private is the ability to “innovate” outside the quarterly earnings pressure of public markets (other reasons are the distraction of the IPO process itself, cost of filings and ongoing SOX compliance, etc.) In most cases, I don’t think the idea that Wall St is too short-term is a valid reason to stay private, though there may be other reasons. There are two related arguments people make. One is that the market is too focused on short-term earnings. The other is that public companies can’t innovate because of this. So I ask: what’s the evidence for this? Some of the most innovative companies in tech – Google, Apple, Amazon, VMWare, eBay, Tesla, Netflix, Linkedin – are public. These companies don’t have any trouble pursuing new initiatives, speculative ventures, interesting M&A, high R&D spend, etc. under the glare of the public market. And every company on this list has been richly rewarded by the market. In fact, some of these companies actively shun Wall St’s supposedly myopic focus on short-term earnings. Amazon continues to be an incredibly low margin business and continues to invest heavily in growth and new businesses. Similarly, Google doesn’t even provide quarterly guidance to investors. The reality is that the public companies that face supposed Wall St “short termism” are the ones that have flawed business models. Would Zynga and Dell (to name two troubled companies) rather be private right now? Of course, well at least we know for sure in the latter company’s case. It would take the heat off. But the reason there’s heat to begin with is they’re flawed companies. People don’t want to play expense-to-produce Zynga style social games on their desktop, and PCs are rapidly losing favor to the tablet revolution. Public markets are very efficient at recognizing this. Maybe the point of all of this is that a few exceptions withstanding, the best companies go public and they have no problem doing so. They’re able to think about the long-term and invest in innovation without difficulty. If you can’t compete effectively under the lights of the public market, don’t blame Wall St. Look in the mirror instead. In Part I of this series on Linkedin, I talked about how traditionally corporate recruitment has been driven by job boards – which are a combination of job postings and resume books – and the professional headhunter offering. The third and fast-growing juggernaut in the recruitment space is, of course, Linkedin. In this post I’ll talk about how Linkedin is disrupting traditional recruiting. As a professional, Linkedin is one of my favorite web services. For work, I probably use it more frequently than any other service besides Gmail. As a work utility, it outshines Facebook by miles. The ways in which it helps business professionals to meet and to interact is clear to anyone who uses the service. If you don’t follow the company or recruitment industry closely, though, Linkedin’s impact on the recruitment space isn’t as obvious. Linkedin’s primary innovations vis-a-vis the recruitment space are really two-fold. The first is that Linkedin has basically created a public resume book. Your Linkedin profile is the modern-day resume. It has all of the same information, but it’s there for all to see. When you submit a resume to Monster or some other job board, it goes into a proprietary resume database. Once submitted, there’s no real incentive for you to continue to resubmit your resume as it gets updated. Your Linkedin profile, in contrast, is public and therefore there’s an incentive to have up-to-date information. So now individual or corporate recruiter has access to the same set of public profiles. The proprietary resume databases of the job boards and the value of the “proprietary networks” of the headhunter are now highly diminished, some exceptions of course withstanding (e.g., board level retained search). Not only is the Linkedin “resume book” public, but it’s also more up-to-date than the traditional resume sources. Linkedin therefore scores on two fronts. Linkedin’s second and related innovation is it’s emphasis on social, which is all based off the fact that profiles are public and have a real life identity attached to them. You come back to Linkedin again and again because of the social features – seeing who’s connected to who, commenting on messages, following companies, joining groups, etc. The traditional job board tries to bring people back with industry news, which is less valuable, easier to replicate, and less frequent a use case than social. What all of this creates is a rich database of professional profiles that are generally up-to-date. This, of course, is fertile hunting ground for recruiters. With a subscription to Linkedin Talent Solutions, a recruiter gets the ability to search Linkedin’s entire database of profiles and to message anyone on the network. This shifts significant power into the hands of recruiters and away from the job board and the headhunter. Talk to any corporate recruiter and they’ll talk about how Linkedin has become an indispensable tool. It shows up in Linkedin’s financial results as well. 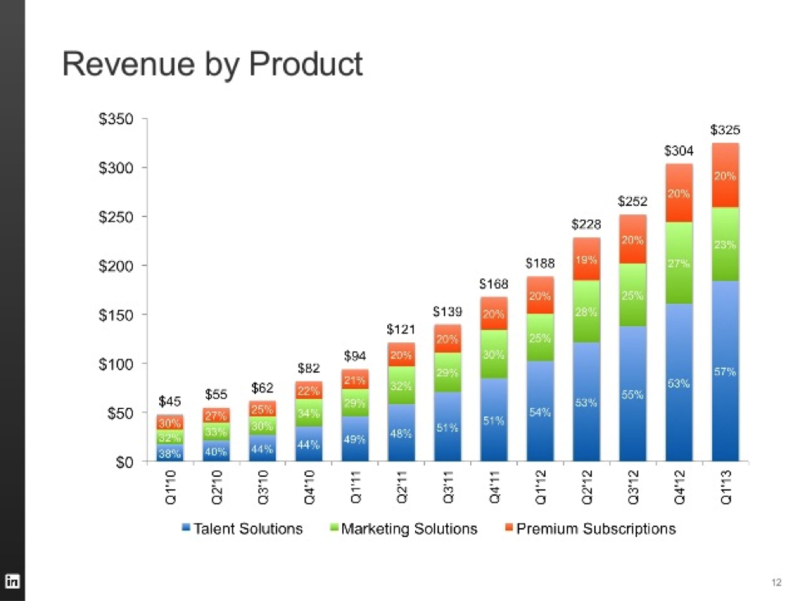 Last quarter, nearly 60% of revenue came from Linkedin’s recruiter focused SaaS offering vs. <40% of revenue in Q1 2010 (see chart below from Linkedin’s Q1 2013 earnings slides). Whether large or small, it’s harder now for a company to justify the cost of using a 3rd party recruiter or heavy use of job boards, though the latter is still quite prominent (see Part I where I discuss how the “death of job boards” is really the death of Monster/CareerBuilder/other generalists). Companies are increasingly favoring hiring of in-house recruiters versus paying contingent search fees. After all, it’s not just in-house recruiters who are using Linkedin but headhunters as well. Everyone’s fishing in the same pond now. Linkedin is now the tool for recruiting passive candidates. Recruiters signed up for Linkedin’s Talent Solutions have the ability to message any person on Linkedin’s network. Linkedin’s network is stronger and more up-to-date than any resume book. It also allows recruiters to see who’s connected to who, which is important as companies increasingly try to turn their current employees into recruiters. All of this has created an awesome revenue trajectory for Linkedin and really put pressure on traditional recruitment offerings. Having said that though, Linkedin’s success and some of its product design choices are creating challenges for both users and recruiters. This is creating opportunities for startups to try to address some of Linkedin’s shortcomings. In Part III of this series, I’ll go into some of the challenges that I see Linkedin facing in the recruiting world and some brief thoughts on how they might go about addressing these.